As Americans become more conscious of the food they put on the table, food labels have played an increasingly large role in how we evaluate our options. We’re looking more and more for the boxes that advertise cage-free, non-GMO and low-calorie products, but at the end of the day, what do those labels really amount to in terms of purchases and sales? It’s almost as if food is the awful ex of the American consumer. We used to love it, falling for it more every day, until we started to see the red flags—maybe the fast food corporations we’d come to adore don’t want the best for us. Maybe our go-to grocery items were hiding a lot more than we thought they could. Maybe our friends were right—these options weren’t any good for us after all. Could it be that our food was truly as deceptive and harmful as the last decade’s onslaught of exposé food documentaries and vocal consumer advocates were telling us? Yes, and we were totally blindsided. Americans no longer blindly trust food providers to give them healthy, safe and natural products. Transparent nutrition facts labels and eye-catching food quality promises give consumers a greater sense of trust in what they’re buying. If you’re looking for grass-fed beef burgers, a box that says so loudly and proudly is going to make it easier to identify that this is the product to buy. It also quickly forms a mental connection between that brand and animal-friendly beef raising practices. Imagine this familiar scenario: you’ve got an hour between picking up the kids after work and when they’ll start asking what’s for dinner. You run by the grocery store, stressed from a day at the office with little ones in tow, trying to navigate crowded aisles and keep your last ounce of patience. You’ve been there, and you know that on days like this, you’re not really thinking about much more than getting in and out of there as quickly as possible. Imagine you come across the wall of children’s cereals. You see one that prominently says natural and you grab it without thinking. You applaud yourself for getting the kids healthy, organic, hormone-free breakfast food, but natural doesn’t mean any of that. It doesn’t necessarily mean anything. Just as labels can create a positive trust between producer and consumer, it can also create a misplaced trust in a product, causing consumers to purchase foods that aren’t any better for them than their non-natural counterparts. Really investigate what your foods are claiming to be and what your brand deems to be natural. 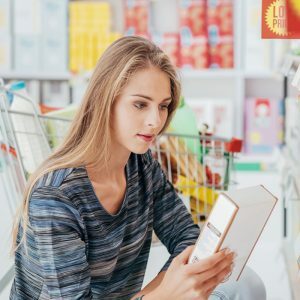 Food labels can give consumers a wealth of great information but also buyer’s remorse if mislabeled—they have a bigger impact on consumer’s purchasing decision than you may know.